Following yesterday’s Barbaric blast, Demon Hunter delivery, and Witch Doctor wipeout, here’s a big wall of Wizard skill Datamining from the latest test version of Reaper of Souls. There’s a formatting improvement to this (and the subsequent posts). You can see all skill and rune changes in side-by-side table comparisons, with the previous version on the left and the updated version on the right. Therefore, instead of me spending time typing out and editing and formatting the changes, we’re presenting the entire list of Wizard skill changes in the handy table format, below the fold. Click through to see those; up here I’ll comment on what I think are some of the more interesting or impactful changes. You guys are welcome to reply to those comments, or to pick out your own key developments. Black Hole was listed in the previous Wizard RoS datamining, but it’s received a few tweaks and some of you guys might not have heard about it yet. Blazar: Conjure a Black Hole at the target location that draws enemies to it and deals 170% (previously 160%) weapon damage as Fire over 2 seconds to all enemies within 15 yards. After the Black Hole disappears, an explosion occurs that deals 454% (previously 260%) weapon damage as Fire to enemies within 15 yards. I like the idea of the skill, though I maintain my objections to the inherent anachronisms created by utilizing modern astronomical terms to a Diablo 3 spell. Since the full list of Wizard skill changes can be seen below, I’m just going to highlight a few for conversation. I’ve sung my little song about how “the Wizard was my most-wanted class pre-game and how I don’t enjoy any of the builds now and it’s very sad, etc.” So I’ll spare you guys a repeat of that and just say that I’m very interested in some of the skill changes. I don’t mean to be a Sorc loyalist, but I do like the D2-style function coming back via some of the runewords. Several of the rune effects sound awesome, and in a weird way, the fact that they’ve actually nerfed the bonuses to Static Force and Arcane Attunement since the last patch is encouraging. So those changes were too good! They sound intriguing also; I enjoy short term buffs and skills that reward you for clever play rather than just expensive gear, and the challenge of getting into a huge mob, WoFing them to stack up your damage for your next attack, and then using it wisely, sounds awesome. That said, it’s the basic skill change that has me excited about this skill. Wave of Force is changing from a defensive attack with a long cooldown into something very much like D2’s Nova. No cooldown and a cost low enough to spam it, and with 351% damage at base and up to 427% from Heat Wave, it should devastate any size group of trash mobs. How is this viable? What am I missing? Thrown Blade: Extend the reach of Spectral Blade to 20 yards and increase its damage to 231% weapon damage as Arcane. Huge damage buffs to Energy Twister — to keep it somewhat useful after the proc coefficient is nerfed to remove its Critical Mass(tery)? Huge damage buffs to Explosive Blast… for the same reason as the buffs to Energy Twister? Critical Mass has not been nerfed, but if proc chances are turned down then CM won’t be resetting cooldowns in a blink, and thus this skill will need damage buffs to be useful with a 6s cooldown? Electrocute with huge damage buffs and other handy rune effect improvements. Up to 10 targets at once! Probably still not good enough, but please let me love you. This was my favorite skill in the entire game as of the Blizzcon 2008 demo, largely since it worked very differently then, (you spun around a stream of lightning, kind of like Disintegrate, and it latched onto anything it came into contact with, sizzling them to a crisp) and back then Lightning crits stunned enemies. Finally, there’s still this. And it even got a huge damage buff. WANT. Frozen Orb: Create an orb of frozen death that shreds an area with ice bolts, dealing up to 393% weapon damage as Cold. Click through for a full list of the Wizard skill changes in the latest RoS patch, sorted in a convenient new/old table. Skills and Rune Effects not listed below were not changed from the previous Reaper of Souls patch, back in September, but that doesn’t mean they aren’t quite different from what you see in D3V today. 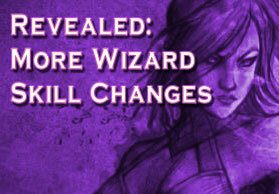 Refer to the previous Wizard skill DM post from last month for many earlier changes. The mandatory disclaimer: these are taken from a work in progress pre-beta version of RoS and things may be quite different in the final game. Electrocute – Advanced Tooltip This is a Signature spell. Signature spells are free to cast. Lightning arcs from your fingertips, dealing 90% weapon damage as Lightning. The lightning can jump, hitting up to 2 additional enemies. This is a Signature spell. Signature spells are free to cast. Electrocute – Lightning Blast Create streaks of lightning that pierce through enemies for 86% weapon damage as Lightning. Create streaks of lightning that pierce through enemies for 280% weapon damage as Lightning. Electrocute – Chain Lightning Increase the maximum number of enemies that can be electrocuted to 6. This skill is affected by your characters: Increase the maximum number of enemies that can be electrocuted to 10. Electrocute – Arc Lightning Blast a cone of lightning that deals 115% weapon damage as Lightning to all affected enemies. Blast a cone of lightning that deals 310% weapon damage as Lightning to all affected enemies. Electrocute – Surge of Power Gain 1 Arcane Power for each enemy hit. This skill is affected by your characters: Gain 3 Arcane Power for each enemy hit. Electrocute – Forked Lightning Critical Hits release 4 charged bolts in random directions, dealing 55% weapon damage as Lightning to any enemies hit. Critical Hits release 4 charged bolts in random directions, dealing 44% weapon damage as Lightning to any enemies hit. Slow Time – Point of No Return Enemies that enter or leave the Slow Time area are stunned for 2 seconds. Enemies that enter or leave the Slow Time area are stunned for 3.5 seconds. Hurl an orb of pure energy that explodes on contact, dealing 381% weapon damage as Arcane to all enemies within 15 yards. Arcane Orb – Obliteration Increase the speed of the orb and its damage to 260% weapon damage as Arcane, but reduce the area of effect to 8 yards. Increase the speed of the orb and its damage to 509% weapon damage as Arcane, but reduce the area of effect to 8 yards. Arcane Orb – Spark Lob an electrified orb over enemies that zaps them for 200% weapon damage as Lightning and increases the damage of the next Lightning spell you cast by 1% for every enemy hit. Lob an electrified orb over enemies that zaps them for 349% weapon damage as Lightning and increases the damage of the next Lightning spell you cast by 1% for every enemy hit. Arcane Orb – Arcane Orbit Create 4 Arcane Orbs that orbit you, exploding for 80% weapon damage as Arcane when enemies get close. Create 4 Arcane Orbs that orbit you, exploding for 221% weapon damage as Arcane when enemies get close. Arcane Orb – Scorch Launch a burning orb that leaves behind a trail of Fire, dealing 100% weapon damage as Fire to enemies it pierces through and 150% weapon damage as Fire when it explodes. The wall of Fire left behind deals 300% weapon damage as Fire over 5 seconds. Launch a burning orb that deals up to 100% weapon damage as Fire. The orb leaves behind a wall of Fire that deals 379% weapon damage as Fire over 5 seconds. Arcane Orb – Frozen Orb Create an orb of frozen death that shreds an area with ice bolts, dealing up to 125% weapon damage as Cold to enemies it pierces through and up to 175% weapon damage as Cold when it bursts. Create an orb of frozen death that shreds an area with ice bolts, dealing up to 393% weapon damage as Cold. Call down shards of ice that deal 776% weapon damage as Cold over 6 seconds to enemies in a 12 yard radius. Multiple casts in the same area do not stack. Blizzard – Unrelenting Storm Increase the duration of Blizzard to deal 680% weapon damage as Cold over 8 seconds. Increase the duration and damage of Blizzard to deal 1389% weapon damage as Cold over 8 seconds. Blizzard – Stark Winter Increase the area of effect of Blizzard to a 22 yard radius. Increase the area of effect and damage of Blizzard to deal 972% weapon damage as Cold over 6 seconds to enemies in a 22 yard radius. Blizzard – Grasping Chill After the Blizzard ends, the ground is covered in a low-lying mist for 3 seconds that Slows the movement speed of enemies by 60%. After the Blizzard ends, the ground is covered in a low-lying mist for 4 seconds that Slows the movement speed of enemies by 60%. Blizzard – Snowbound Reduce the casting cost of Blizzard to 20 Arcane Power. Reduce the casting cost of Blizzard to 10 Arcane Power. Blizzard – Frozen Solid Enemies caught in the Blizzard have a 20% chance to be Frozen for 3 seconds. Enemies caught in the Blizzard have a 25% chance to be Frozen for 3 seconds. Blast nearby enemies with an explosion of ice and freeze them for 3 seconds. Frost Nova – Frozen Mist Frost Nova no longer freezes enemies, but instead leaves behind a mist of frost that deals 160% weapon damage as Cold over 8 seconds. Frost Nova no longer freezes enemies, but instead leaves behind a mist of frost that deals 1592% weapon damage as Cold over 8 seconds. Frost Nova – Cold Snap Reduce the cooldown of Frost Nova to 9 seconds. Reduce the cooldown of Frost Nova to 7.5 seconds. Frost Nova – Deep Freeze Gain a 15% bonus to Critical Hit Chance for 12 seconds if Frost Nova hits 5 or more enemies. Gain a 15% bonus to Critical Hit Chance for 15 seconds if Frost Nova hits 5 or more enemies. Summon a multi-headed Hydra for 15 seconds that attacks enemies with bolts of fire dealing 28% weapon damage as Fire. Summon a multi-headed Hydra for 15 seconds that attacks enemies with bolts of fire dealing 101% weapon damage as Fire. Hydra – Frost Hydra Summon a Frost Hydra that breathes a short range cone of frost, causing 36% weapon damage as Cold to all enemies in the cone. Summon a Frost Hydra that breathes a short range cone of frost, causing 222% weapon damage as Cold to all enemies in the cone. Hydra – Lightning Hydra Summon a Lightning Hydra that electrocutes enemies for 64% weapon damage as Lightning. Summon a Lightning Hydra that electrocutes enemies for 222% weapon damage as Lightning. Hydra – Blazing Hydra Summon a Blazing Hydra that leaves a pool of fire, dealing 18% weapon damage per second as Fire to enemies who remain in the pool. Summon a Blazing Hydra that leaves a pool of fire, dealing 96% weapon damage per second as Fire to enemies who remain in the pool. Hydra – Mammoth Hydra Summon a Mammoth Hydra that breathes a river of flame at nearby enemies, dealing 67% weapon damage per second as Fire to enemies caught on the burning ground. Summon a Mammoth Hydra that breathes a river of flame at nearby enemies, dealing 287% weapon damage per second as Fire to enemies caught on the burning ground. Hydra – Arcane Hydra Summon an Arcane Hydra that spits Arcane Orbs that explode on impact, dealing 60% weapon damage as Arcane to enemies near the explosion. Summon an Arcane Hydra that spits Arcane Orbs that explode on impact, dealing 178% weapon damage as Arcane to enemies near the explosion. Magic Missile – Advanced Tooltip This is a Signature spell. Signature spells are free to cast. Launch a missile of magic energy, dealing 125% weapon damage as Arcane. This is a Signature spell. Signature spells are free to cast. Launch a missile of magic energy, dealing 170% weapon damage as Arcane. Magic Missile – Charged Blast Increase the damage of Magic Missile to 163% weapon damage as Arcane. Increase the damage of Magic Missile to 240% weapon damage as Arcane. Magic Missile – Split Fire 3 missiles that each deal 56% weapon damage as Arcane. Fire 3 missiles that each deal 80% weapon damage as Arcane. Magic Missile – Conflagrate Missiles pierce through enemies and cause them to burn for 30% weapon damage as Fire over 3 seconds. Missiles pierce through enemies and cause them to burn for 371% weapon damage as Fire over 3 seconds. Magic Missile – Glacial Spike Cast out a shard of ice that explodes on impact, causing enemies within 4.5 yards to take 88% weapon damage as Cold and be frozen for 1 second. Enemies cannot be frozen by Glacial Spike more than once every 5 seconds. Cast out a shard of ice that explodes on impact, causing enemies within 4.5 yards to take 157% weapon damage as Cold and be frozen for 1 second. Magic Missile – Seeker Missiles track the nearest enemy. Missile damage is increased to 138% weapon damage as Arcane. Missiles track the nearest enemy. Missile damage is increased to 211% weapon damage as Arcane. Shock Pulse – Advanced Tooltip This is a Signature spell. Signature spells are free to cast. Release a medium range pulse of 3 unpredictable charges of electricity that deal 150% weapon damage as Lightning. This is a Signature spell. Signature spells are free to cast. Release a medium range pulse of 3 unpredictable charges of electricity that deal 204% weapon damage as Lightning. Shock Pulse – Fire Bolts Cast 3 bolts of fire that each deal 195% weapon damage as Fire. Cast 3 bolts of fire that each deal 288% weapon damage as Fire. Shock Pulse – Living Lightning Conjure a being of lightning that drifts forward, electrocuting nearby enemies for 53% weapon damage as Lightning. Conjure a being of lightning that drifts forward, electrocuting nearby enemies for 165% weapon damage as Lightning. Shock Pulse – Piercing Orb Merge the bolts in a a single giant orb that oscillates forward dealing 105% weapon damage as Lightning to everything it hits. Merge the bolts in a a single giant orb that oscillates forward dealing 214% weapon damage as Lightning to everything it hits. Shock Pulse – Lightning Affinity Gain 3 Arcane Power for each enemy hit. Gain 5 Arcane Power for each enemy hit. Shock Pulse – Explosive Bolts Slain enemies explode, dealing 105% weapon damage as Lightning to every enemy within 10 yards. Slain enemies explode, dealing 252% weapon damage as Lightning to every enemy within 10 yards. Discharge a wave of pure energy that deals 351% weapon damage as Arcane to nearby enemies. Wave of Force – Impactful Wave Wave of Force repels projectiles, knocks back nearby enemies and Slows them by 60% for 3 seconds. Wave of Force gains 6 second cooldown. Wave of Force repels projectiles, knocks back nearby enemies and Slows them by 60% for 4 seconds. Wave of Force gains 5 second cooldown. Wave of Force – Static Pulse Enemies hit by Wave of Force take 20% increased damage from Lightning for 4 seconds. Enemies hit by Wave of Force take 15% increased damage from Lightning for 4 seconds. Wave of Force – Heat Wave Increase the damage to 195% weapon damage as Fire. Increase the damage to 427% weapon damage as Fire. Wave of Force – Arcane Attunement Each enemy hit increases the damage of your next Arcane spell by 3%. Each enemy hit increases the damage of your next Arcane spell by 2%. Summon an immense Meteor that plummets from the sky, crashing into enemies for 506% weapon damage as Fire. The ground it hits is scorched with molten fire that deals 169% weapon damage as Fire over 3 seconds. Meteor – Molten Impact Increases the damage of the Meteor impact to 1560% weapon damage as Fire and the molten fire to 360% weapon damage as Fire over 3 seconds. Adds a 15 second cooldown. Increases the damage of the Meteor impact to 2504% weapon damage as Fire and the molten fire to 836% weapon damage as Fire over 3 seconds. Meteor – Meteor Shower Unleash a volley of 7 small Meteors that each strike for 104% weapon damage as Fire. Unleash a volley of 7 small Meteors that each strike for 230% weapon damage as Fire. Meteor – Comet Summon a Comet that deals 312% weapon damage as Cold and has a 20% chance to freeze enemies for 1 second upon impact. The impact site is covered in a freezing mist that deals 72% weapon damage as Cold and Slows enemy movement by 60% over 3 seconds. Summon a Comet that deals 583% weapon damage as Cold and has a 20% chance to freeze enemies for 1 second upon impact. The impact site is covered in a freezing mist that deals 195% weapon damage as Cold and Slows enemy movement by 60% over 3 seconds. Meteor – Lightning Bind If the initial impact causes a Critical Hit, the electrified Meteor duration is increased to 8 seconds and enemies are rooted for 3 seconds. Meteor’s damage turns into Lightning. If the initial impact causes a Critical Hit, the electrified Meteor duration is increased to 8 seconds and enemies are rooted for 4 seconds. Meteor’s damage turns into Lightning. Spectral Blade – Advanced Tooltip This is a Signature spell. Signature spells are free to cast. Summon a spectral blade that strikes all enemies up 15 yards in front of you for 165% weapon damage as Arcane. This is a Signature spell. Signature spells are free to cast. Summon a spectral blade that strikes all enemies up 15 yards in front of you for 168% weapon damage as Arcane. Spectral Blade – Flame Blades Each enemy hit increases the damage of your Fire spells by 1% for 5 seconds. Each enemy hit increases the damage of your Fire spells by 1% for 3 seconds. Spectral Blade – Thrown Blade Extend the reach of Spectral Blade to 20 yards. Extend the reach of Spectral Blade to 20 yards and increase its damage to 231% weapon damage as Arcane. Spectral Blade – Ice Blades Chilled enemies have a 10% chance to be Frozen and Frozen enemies have a 10% increased chance to be critically hit by Spectral Blade. Chilled enemies have a 5% chance to be Frozen and Frozen enemies have a 5% increased chance to be critically hit by Spectral Blade. Spectral Blade – Siphoning Blade Gain 3 Arcane Power for each enemy hit. Gain 5 Arcane Power for each enemy hit. Ice Armor – Frozen Storm A whirling storm of ice builds around you, dealing 10% weapon damage as Cold every second. A whirling storm of ice builds around you, dealing 11% weapon damage as Cold every second. Ice Armor – Chilling Aura Lower the temperature of the air around you. Nearby enemies are chilled, slowing their movement speed by 30%. Lower the temperature of the air around you. Nearby enemies are chilled, slowing their movement speed by 80%. Ice Armor – Jagged Ice Melee attackers also take 130% weapon damage as Cold. Melee attackers also take 189% weapon damage as Cold. Bathe yourself in electrical energy, periodically shocking a nearby enemy for 100% weapon damage as Lightning. Lasts 4 minutes. Bathe yourself in electrical energy, periodically shocking a nearby enemy for 147% weapon damage as Lightning. Lasts 4 minutes. Storm Armor – Thunder Storm Increase the damage of the shock to 130% weapon damage as Lightning. Increase the damage of the shock to 194% weapon damage as Lightning. Storm Armor – Reactive Armor Ranged and melee attackers are shocked for 70% weapon damage as Lightning. Ranged and melee attackers are shocked for 189% weapon damage as Lightning. Storm Armor – Shocking Aspect Critical Hits have a chance to electrocute a nearby enemy for 35% weapon damage as Lightning. Critical Hits have a chance to electrocute a nearby enemy for 51% weapon damage as Lightning. Magic Weapon – Force Weapon Increase the damage bonus of Magic Weapon to 15% damage and grants a 2% chance to Knockback any enemies hit. Increase the damage bonus of Magic Weapon to 20% damage and grants a 2% chance to Knockback any enemies hit. Magic Weapon – Ignite Attacks burn enemies, dealing 15% weapon damage as Fire over 3 seconds. Attacks burn enemies, dealing 32% weapon damage as Fire over 3 seconds. Unleash a twister of pure energy that deals 769% weapon damage as Arcane over 6 seconds to everything in its path. Energy Twister – Gale Force Enemies hit by Energy Twister take 30% increased damage from Fire for 6 seconds. Enemies hit by Energy Twister take 15% increased damage from Fire for 4 seconds. Energy Twister – Raging Storm When two Energy Twisters collide, they merge into a tornado with increased area of effect that causes 360% weapon damage as Arcane over 6 seconds. When two Energy Twisters collide, they merge into a tornado with increased area of effect that causes 1575% weapon damage as Arcane over 6 seconds. Energy Twister – Storm Chaser Each cast of Energy Twister grants you a Lightning Charge. You can store up to 3 Lightning Charges at a time. Casting a Signature spell releases all Lightning Charges as a bolt of Lightning that deals 75% weapon damage as Lightning per Lightning Charge. Energy Twister’s damage turns into Lightning. Electrocute Each cast of Energy Twister grants you a Lightning Charge. You can store up to 3 Lightning Charges at a time. Casting a Signature spell releases all Lightning Charges as a bolt of Lightning that deals 150% weapon damage as Lightning per Lightning Charge. Energy Twister – Mistral Breeze Reduce the casting cost of Energy Twister to 10 Arcane Power. Energy Twister’s damage turns into Cold. Reduce the casting cost of Energy Twister to 25 Arcane Power. Energy Twister’s damage turns into Cold. Energy Twister – Wicked Wind Energy Twister no longer travels but spins in place, dealing 252% weapon damage as Arcane over 6 seconds to everything caught in it. Energy Twister no longer travels but spins in place, dealing 527% weapon damage as Arcane over 6 seconds to everything caught in it. Cooldown: 6 secondsGather an infusion of energy around you that explodes after 1.5 seconds for 1021% weapon damage as Arcane to all enemies within 12 yards. Explosive Blast – Short Fuse Immediately release the energy of Explosive Blast for 225% weapon damage as Fire. Immediately release the energy of Explosive Blast for 1021% weapon damage as Fire. Explosive Blast – Time Bomb Explosive Blast detonates from the point it was originally cast after 2.5 seconds for 315% weapon damage as Arcane. Explosive Blast detonates from the point it was originally cast after 2.5 seconds for 1489% weapon damage as Arcane. Explosive Blast – Chain Reaction Instead of a single explosion, release a chain of 3 consecutive explosions, each dealing 97% weapon damage as Fire. Instead of a single explosion, release a chain of 3 consecutive explosions, each dealing 396% weapon damage as Fire. Channel a beam of pure energy forward, dealing 393% weapon damage as Arcane and disintegrating enemies it kills. Disintegrate – Intensify Enemies hit by Disintegrate take 30% increased damage from Arcane for 4 seconds. Enemies hit by Disintegrate take 15% increased damage from Arcane for 4 seconds. Disintegrate – Entropy The beam fractures into a short-ranged cone that deals 253% weapon damage as Arcane. The beam fractures into a short-ranged cone that deals 499% weapon damage as Arcane. Disintegrate – Chaos Nexus While channeling the beam you become charged with energy and discharge at nearby enemies dealing 44% weapon damage as Arcane. While channeling the beam you become charged with energy and discharge at nearby enemies dealing 88% weapon damage as Arcane. Disintegrate – Volatility Enemies killed by the beam have a 35% chance to explode causing 395% weapon damage as Arcane to all enemies within 8 yards. Enemies killed by the beam have a 35% chance to explode causing 562% weapon damage as Arcane to all enemies within 8 yards. Project a beam of frozen ice that blasts enemies within 5 yards of the first enemy hit for 410% weapon damage as Cold and Slows their movement by 60% for 3 seconds. Ray of Frost – Snow Blast Enemies hit by Ray of Frost take 30% increased damage from Cold for 4 seconds. Enemies hit by Ray of Frost take 15% increased damage from Cold for 4 seconds. Ray of Frost – Sleet Storm Create a swirling storm around you that grows up to a 22 yard radius, dealing 364% weapon damage as Cold to all enemies caught within it. Create a swirling storm around you that grows up to a 22 yard radius, dealing 425% weapon damage as Cold to all enemies caught within it. Ray of Frost – Numb Increase the Slow amount to 80% for 4 seconds. This skill is affected by your characters: Ray of Frost has a 15% chance to Freeze enemies for 1 second and increases the Slow amount to 80% for 3 seconds. Ray of Frost – Cold Blood Reduce casting cost to 10 Arcane Power. Reduce casting cost to 11 Arcane Power. Ray of Frost – Black Ice Enemies killed by Ray of Frost leave behind a patch of ice that deals 504% weapon damage as Cold to enemies moving through it over 3 seconds. Enemies killed by Ray of Frost leave behind a patch of ice that deals 1134% weapon damage as Cold to enemies moving through it over 3 seconds. Spells cast by your Mirror Images will deal 8% of the damage of your own spells. Mirror Image – Mirror Mimics Spells cast by your Mirror Images will deal 40% of the damage of your own spells. Spells cast by your Mirror Images will deal 18% of the damage of your own spells. Mirror Image – Duplicates Summon 5 Mirror Images that each have 25% of your Life. Summon 4 Mirror Images that taunt nearby enemies for 1 second and each have 50% of your Life. Mirror Image – Simulacrum Increase the Life of your Mirror Images to 100% of your own. Increase the Life of your Mirror Images to 200% of your own. Mirror Image – Extension of Will Increase the duration of Mirror Image to 10 seconds and their Life to 29% of your Life. Increase the duration of your Mirror Images to 10 seconds and their Life to 100% of your Life. Mirror Image – Mocking Demise When a Mirror Image is destroyed, it explodes, dealing 45% weapon damage as Arcane with a 50% chance to Stun for 2 seconds. When a Mirror Image is destroyed, it explodes, dealing 419% weapon damage as Arcane with a 50% chance to Stun for 2 seconds. Paralysis – Advanced Tooltip Lightning damage dealt to enemies has up to a 10% chance to Stun the target for 1.5 seconds. Lightning spells have a 10% chance to Stun all targets hit for 1.5 seconds. It synergizes with other cold spells lol! Black hole has a 8 second cool down. Do you really want to wait 8 seconds to use the added cold dmg. The idea behind this is that you cast black hole to get, let say 75% more damage with next gold spell. Then you hit them with Frozen orb, Blizzard or any other cold spell to get the added cold dmg. Funny, I posted this Wizard Skill idea back in 2009 in the old D3 official forums and got great feedback. I had given it other name though, wish I could dig that post up again..
See, this new Arcane Orb is how runes should have been done in the beginning. Not this “buffs x damage type by y%” or “costs z less resource” junk we have now. That is stuff they could have (and did) use on gear. I guess it’s easier to come up w/ crazy runes for the Wizard than, say, the Barb, but w/ the proposed changes to Legendary affixes, runes should be way more varied and important than they are now. And the Wiz still needs to dump her fake passives; Force Weapon and Armors are stupid passive, they need a function so that you want to push the button tactically. Something a little more impressive than the Monk’s “double mantra” for three seconds (those need work, too). Yeah, all semi-passive skills should get an on-use effect. While mantras on-use effect can be lackluster, they are still the correct way to do it. Just more interesting and useful than that. I like the changes to Wizard more than any other class. A lot more meaningful than what we’ve seen other classes get, which so far are all just damage boosts/tweaks and some general adjustment of how they operate. Hopefully other classes get this kind of revision. As a Wizard main, I am very happy with the changes. This combined with elemental effects returning should finally make the class the style of Wizard I wanted to play. I enjoy Archon Wizard, but it really felt a lot more special when it was a huge burst of massive damage, rather than an always-on buff. Speaking of Archon form, I hope they buffed the damage on it, as compared with these awesome damage buffs and the fact that Archon can’t go beyond 15 seconds now, Archon might need a buff to make it viable. That said, ideally they would give Archon form all-new spells, rather than having re-skinned versions of existing spells (the three spells are: AoE Melee Attack, Disintegrate and immediate Explosive Blast). Perhaps a variant of Archon that doesn’t change your skills, so it acts as a buff to all your other skills? Archon got a pretty big suite of changes, Flux just didn’t aggregate them here. 10% more Armor/Resistance, duration increased to 20 seconds, 12% bonus damage per kill (up from 3%), 3 second teleport cooldown (down from 4), 6600% damage on Arcane Destruction (from 1600%), 60% damage on Improved Archon (up from 25%). The lower teleport cooldown and the huge spike on Arcane Destruction should make them pretty appealing alternatives to Improved Archon, 3 seconds on Teleport should allow for relatively frequent re-positioning. Looks like a Meteorb wiz is gonna be a realistic possibility. Just need a Fireball skill and it will be complete. Maybe Magic Missile Conflagrate will suffice. The Molten Impact buff is awesome, though 15 seconds is a long cooldown. Wonder how the proc will end up working for CM on that skill. Still, I like the ‘nuke’ aspect. You could collect large mobs with a Supermassive Black Hole, then throw a Frozen Orb through and drop a giant Cold Blooded buffed Meteor to crush all of them. “Increase the maximum number of enemies that can be electrocuted to 10. By my character’s what? Need to know! Always wanted to like Electrocute. Will be really interesting to see builds based around new gear. Something like Ray of Frost Snow Blast used with Cold Blooded and the unique that makes RoF pierce could be really powerful. One of the Arcane Orb skills has basically become a Fireball. Throw orb of fire burn things, yadda yadda. Oh, it also leaves behind a wall of fire when thrown. So you get everything and more. That would have said “skill level.” It’s a lingering bug that’s mostly fixed in the DiabloNut datamining thing. Some skills have code (in the game files) that references skill points, from back when those existed, and we haven’t eliminated all mention of it in our DB yet. The idea of black holes was first put forward about 230 years ago, so it’s not all that modern, but I guess the other terms used for the runes are. Does the idea of a meteor spell bother you? We’ve actually had the idea of black holes about the same amount of time we’ve had the idea that meteors are rocks from space (as opposed to some weird atmospheric glitch). I think it works, though. Magic seems very tied to astronomical things, both in the sense that you have things like star signs and horoscopes and so on, plus the image of a wizard wearing a robe covered in stars and moons. They know about different dimensions in the Diablo setting, so it’s not out of the question they’d know about other scientific things that we didn’t know at an equivalent point in our history. I think Horazon’s construction of an Escher maze in D2 proves that some of the minds of Sanctuary operate on a knowledge base far, far beyond what we in the modern world have. If you’ve got the arcane knowledge to generate black holes and what I assume to be near-absolute zero temperatures, it would make sense to have words for those processes, and it’s not entirely far-fetched they’d come up with the same words we have. Nerfs to Ice Blades – why Blizzard, why!?!?!?!?!?!?!? How did they justify the “Each enemy hit increases the damage of your Fire spells by 1% for 3 seconds.” of Spectural blades fire rune? Looks like this needs to be longer and more powerful to be worth using. I think some of whether this rune will be useful depends a bit on the mechanics of the damage buff. If it resets after each cast it’ll be pretty good for clearing out crowds but not much use at anything else. However, if, for example, it works by giving you a stack every time you hit something, and those stacks then decay as their individual duration expires, this could be pretty strong. You could get huge damage boosts against big packs of monsters while still being able to get respectable damage output against elites. There’s also a third option where it’d stack each time you cast blades and the stacks all persist as long as you don’t let the buff duration run out, which would be pretty strong for reasons that should be obvious. Knowing Blizz it’ll probably the first, but there’s no way to be sure until we actually try it. Can’t wait to actually sink my teeth into this. Ah cool, thanks for the advice, hopefully it will work for the best :). Then it is indeed fine. I really want to try to build a cold based Wizard so bad now. Use “Black hole – Absolute Zero” in the Middle of the pack to draw enemies together and get a nice bonus cold damage with next cold spell. If you hit 8 enemies you’ll get a nice 96% more dmg. Then you start using “Ray of Frost – Snow Blast” with added pierce legendary affix for another 15% more cold damage. To a total of 111% increased dmg. That’s pierce and spash for 410%*2.1 = 861% weapon dmg per second as long as you keep channeling. DAMN! So finally, which is right diablonuts (nothing) or diablofans (many buffs) about the archon skill changes?